Residents will be alarmed to discover that both Emperor Sidious, the Dark Lord of the Sith and Darth Vader, his long time apprentice, have joined the H&F Conservative Party (see pic). 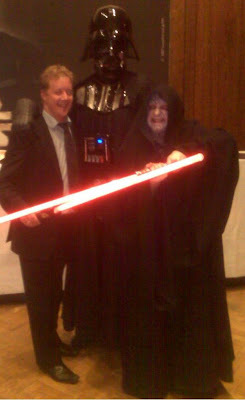 We increasingly live in a climate where high profile celebrity endorsements can pay huge political dividends and so H&F Conservatives will have been initially delighted to see the two Sith Lords posing with Cllr. Paul Bristow (Con), the newly promoted Cabinet Member for Residents Services. However, many will question the wisdom of our local Tories in seeking the backing of the two most evil men in the universe. We are awaiting confirmation as to whether the Sith Emperor - who is openly committed to the triumph of the dark side - will play any role in helping the Conservatives develop H&F Council policy over the coming years.